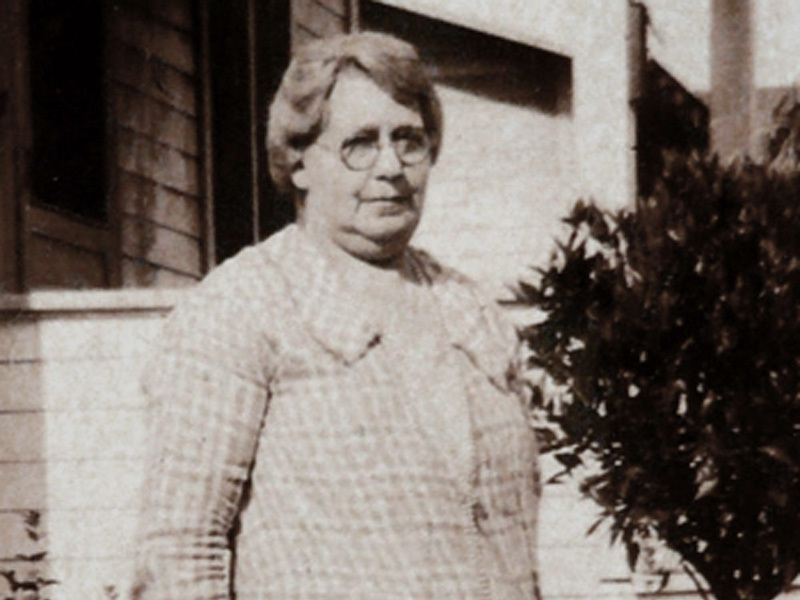 SCVHistory.com | Obituaries | Felda (aka Velda) Louella Smith Pike, St. Francis Dam Victim, d. 1928. 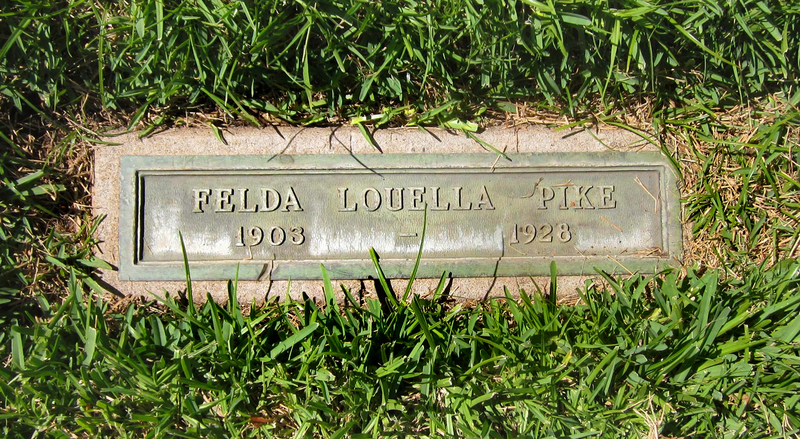 Felda (aka Velda) Louella Smith Pike, St. Francis Dam Victim. Felda Louella Smith (Pike) was the daughter of Monte and Stella Smith. Monte was the caretaker of the Dry Canyon Reservoir in Saugus at one time. 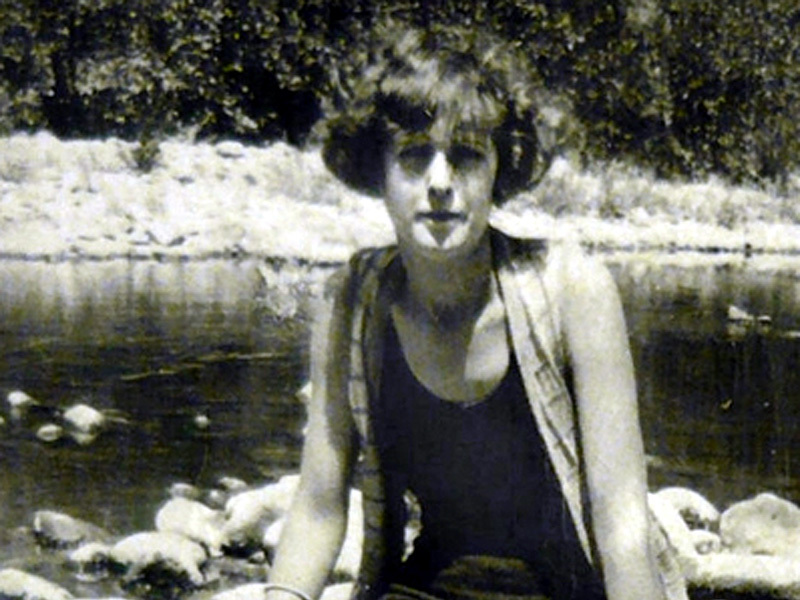 Felda's brother was James Bruitt Smith, who married Louise Courtemanche, a daughter of the founders of the National Forest Inn on the Ridge Route (1916) and the French Village in Newhall (1926). Around 1922 or 1923, Felda married Richard Earl Pike Sr., who became assistant damkeeper to Tony Harnischfeger at the St. Francis Dam. Felda and her husband lived with their 4-year-old son Richard Jr. in the Powerhouse 2 community at the time of the disaster on March 12, 1928. As noted here, the floodwaters carried Felda's body nearly 50 miles. See also: Memorial Plaque for 7 Saugus Community Club Members (including Felda Pike). The Newhall Signal and Saugus Enterprise | Thursday, April 19, 1928. 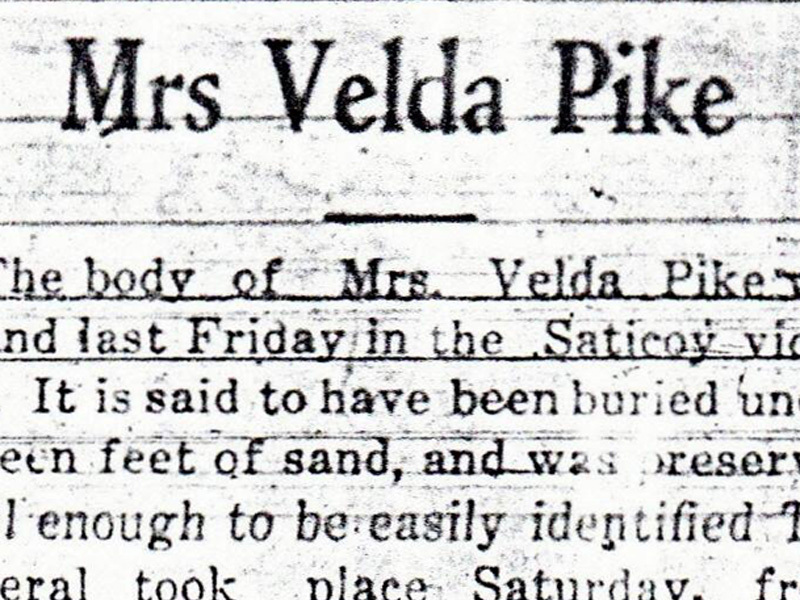 The body of Mrs. Velda [sic; s/b Felda] Pike was found last Friday in the Saticoy vicinity. It is said to have been buried under fifteen feet of sand, and was preserved well enough to be easily identified. The funeral took place Saturday, from Noble's Undertaking parlors; interment was in Oakwood Cemetery, beside her husband and little son, whose bodies were recovered the first day after the flood. Rev. W.H. Evans conducted the services, with Mrs. A. Lane who gave touching solos. In Memory of Velda Smith Pike. Some 20 years ago I remember my first acquaintance with little Velda Smith, a child of four years. It was in the Cochilla [sic] Valley in a little desert town called Indio. After a short acquaintance, her parents, Mr. and Mrs. Monte Smith, moved away from Indio, coming to Saugus to make their home. We, too, followed in a few years to make our home here and renew our acquaintance of the desert days. We watched her grow up and graduate from the Saugus school in the class of 1918, then entering the San Fernando high school, where she met and married her husband, Earl Pike, at the age of 18 years. A year later a baby boy was welcomed into their home, little Richard Pike. She was loved by each and every one of the community, where she had grown from a little girl into a beautiful woman, always a loving daughter, wife and mother. Mr. and Mrs. Monte Smith and family wish to thank their many friends and relatives for their kind remembrances and floral gifts during their recent bereavement. 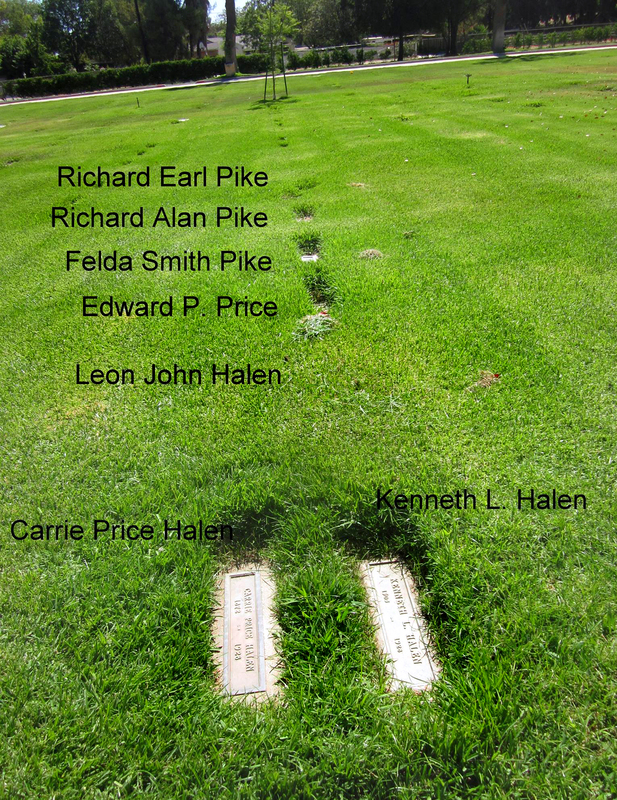 Felda Pike Interment at Oakwood Cemetery. Photos by Ann Stansell, Sept. 16, 2013.